did you know that every time I write that - I sing this song in my head . . . for the rest of the day? so, christmas was great. way great. because my crown roast with apple sage stuffing turned out wonderfully (along with mustard roasted potatoes, gingered carrots and apple walnut salad with cranberry vinaigrette). because my peppermint trifle was awesome. I pledge to make this again. 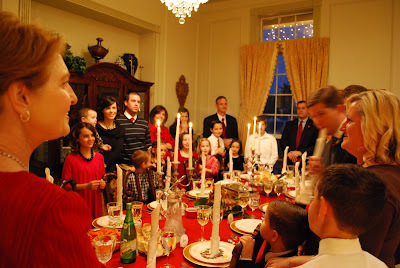 because the traditional 12 days of christmas around the dining table was festive, as always. 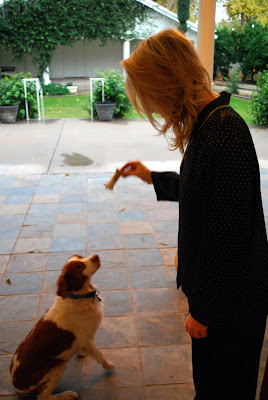 because jimmy loved me for throwing him a bone (a little gift to him from me via RMCF). and because my hair looks beautiful. morning faces are the best! because stephen and leone are having a baby (my heart!) and also because stephen's face looks a little leprechan-ish . . . which isn't surprising when you take into account this picture from a couple of years ago. oh, weevel, I love you. 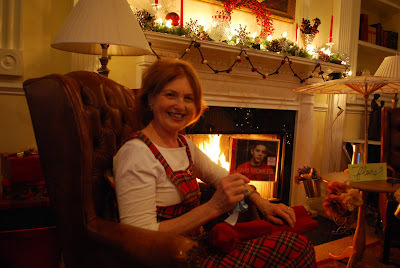 because santa put the david archuleta cd in my mom's stocking and I haven't seen her laugh that hard in a long time. priceless. because the week we just spent at the cabin was great (a little scary at times) but great. 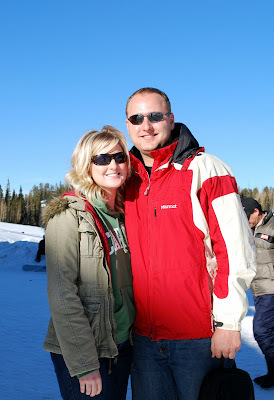 we did all the things I promised plus went to sunrise ski resort. and because I am crazy blessed. I have a feeling that 2009 is going to be amazing . . .
My first time commenting - I so love your sweet and happy blog. I got a beautiful trifle dish for Christmas and get really excited whenever I see new trifle recipes. My question: did you substitute something for the liqueur? I never know what to do with recipes that call for alcohol when you don't cook it out. I'd appreciate any help you can give me. Thanks! Liz, I was laughing so hard at the leprechaun comment. And that picture of you guys jumping...I love it. Anyway, it was great to see you a couple weeks ago and I'm happy to be able to peek in at your blog. I really need to get some recipes from the delish blog because I need a change. That is all. I hope I can see you again soon. You sure are sweet. Happy New Year! So glad you spent it surrounded with love and your family! 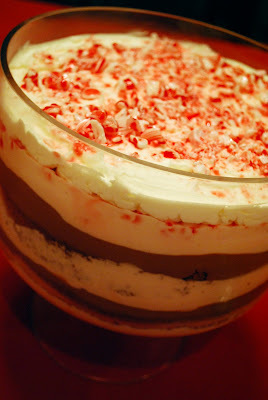 Share the peppermint trifle recipe please! Wow, gorgeous food...mouth watering...and a gorgeous Christmas. 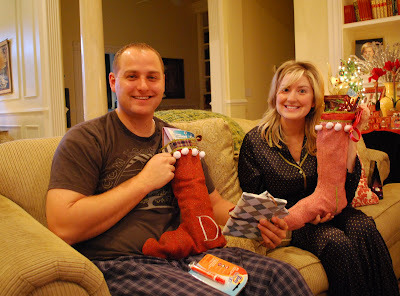 And I must say when I read the part about your mom's stocking, I could hear her laughing...hilarious! Nice to have you back :) Glad you had a good time! I appreciate the happiness in your post. Wonderful! Liz, I may have just spent 15 minutes looking at you food blog. I'm completely envious of your talent to cook (in the best way possible)! It looks like you guys had a great holiday and I love the morning photos of you and David. Thanks so much for the response! I hate that so many cooks that I love use liqueur in everything (Ina Garten for one.) I just don't want to have to buy it, you know??? So it was nice to hear you can leave it out and it doesn't have any ill effects. Thanks again! Did you make that whole gourmet Christmas dinner??? Girl, you have got some serious cooking skills! Looks like a fun Christmas! 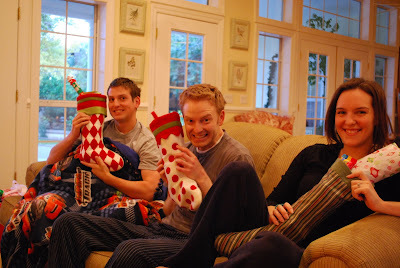 Thats so funny your mom got the David Archuletta cd in her stocking! ha ha. I have been in a peppermint frenzy this past Christmas season. I was told that come the new year I had to give it up and I think I am still having withdraws. Anyway it all looks amazing. Glad to hear you had fun. So when are you coming up here to visit your brother again? Soon? Ever? I love to read your posts and your recipes on your food blog are delicious. Thank you for being so willing to share! You are a talented person! I would LOVE to know the recipe for that roast. I also am interested in learning how your family does those napkins on the plates on the Christmas dinner table... They are gorgeous! That table looked so inviting! I'd love to know the festive and traditional "12 Days of Christmas around the Table" that you do. I'm always looking for new ideas and possible traditions to help warm my home during the holidays. Thank you! I'd forgotten about that song. Thanks for reminding me! Please submit the picture of your roast to a food magazine. It is too beautiful to even touch, although I'm sure it tastes amazing too. Lucky David. Happy New Year. Your first picture makes me so hungry. Wait..I just ate. Oh my gosh, "where do I begin?" gets in my head so much too. And I LOVE THAT MOVIE. p.s. can the Jones family walk over to the Nielsons next year for Christmas? Because Christmas looks magical at your house.. I'm so happy to have found your lovely,lovely blog! 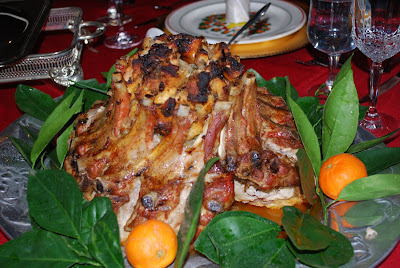 Oh my goodness, it is late and now I am very hungry:-) Your christmas meal looks amazing! I am loving reading your blog. Your Christmas looked perfect. When I grow up, I want to learn how to make a perfect crown roast.